Rameshwaram, Tamil Nadu: His workplace stinks of dead, rotting seafood, a scent that reaches the nose before the factory’s gates can even be opened. N. Guni, a gaunt, hollow-eyed Muslim, makes a living acid-washing conches used during prayer ceremonies in Hindu temples. The smell of putrid acid lingers even at night. Guni, whose family lives on a desolate stretch by the ocean, thinks little beyond these waters, saying he was born here and is meant to die here. “Where will I go? Where will any of us go? This sea is our life," he says. 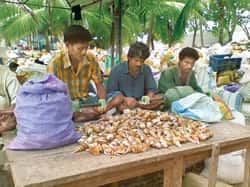 While many cultures consider the mollusc a delicacy, many Hindus, especially vegetarians, find the meat “repulsive", said S. Kalam, owner of Rameshwaram-based Kalam Seashells and Handicrafts, one of the top conch production houses in the country. “They find smell of unclean conches quite unbearable." And so Hindu traders from Karnataka, Gujarat, West Bengal and the Andaman & Nicobar Islands send their catch of shells and conches to factories here. About 3,000 families in Rameshwaram work in this cottage industry, grateful for the regular income in a poor region defined by fluctuating and unreliable fishing seasons. It is believed to be one of the oldest industries, with shell necklaces and bangles found in the ruins of Harappa civilization, dating back to more than 2,000 years before the birth of Christ. Blown during prayer ceremonies and auspicious events, the conch represents power. During the epic war in the Mahabharat, every warrior blew his own conch. Today, its modern-day relevance in pujas that unfold in ornate temples to the simpler altars of home—especially among Hindus in eastern states such as West Bengal and Assam—is indisputable. Later this month, as Hindus mark Durga Puja, the sounds of the conch will punctuate many celebrations. “Blowing a conch in a temple destroys germs and bacteria that cannot survive the high-frequency sound," said S. Chaturvedi Maharaj, a priest at a small Shiva temple in Varanasi. It has become a cultural symbol as well, he said. “No Bengali wedding is complete without blowing a conch. And in Bengal, married women wear bangle made of conches." The factories pay workers such as 47-year-old S. Jalaluddin Rs106 for 16 hours of work each day. Pulling out calloused hands from white, plastic gloves, Jalaluddin gestures at the five acres that surround his factory—heaped with different types of seashells among thatch-leaf shanties, open cottages and banyan trees—and estimates there are 50 tonnes of shells. He and 110 other workers will clean, polish and paint piles of these smelly seashells to make them worthy of entering a temple and then being blown. His colleague, Guni has been acid-washing conches for three decades, and earns Rs80 a day. “I don’t mind it. I have friends," he shrugs, tugging at the white and green cloth around his waist. Some have sought to leave—only to come back. S. Jattarullah, tired of making lampshades, shell-curtains, artifacts and earning per piece, found a job as a labourer in Saudi Arabia. Two years ago, he returned to the conches and their artistic offspring. Tying shells onto a lamp, Jattarullah simply says life after moving away from here simply didn’t work out. Not many aspire for change. Kalam, a distant relative of A.P.J Abdul Kalam whose shell shop is next to the former president’s ancestral home, shrugged at the mention and said the connection simply meant more customers coming to his shop. “People come to see his house as a tourist attraction, think this shop belongs to his family and come in to buy," he grins. Fishermen who don’t work in these factories hunt for conches on the seabed and sell them to the factory agents in the local market. The conches are not hard to find, local fishermen say. V. Vinod, a Hindu, says: “There are special nets that drag the bottom of the seabed to catch the fish that thrive very close to the bottom. Those nets also bring up conches." But the rare ones cannot be so easily had. So others dive in. K. Dawood, 20, who does not own the special net, dives in every other day. “It is better if you have the net, because inside you cannot hold your breath for long and it is hard to look for those special conch that turns on the left hand-side, instead of the right." Since the goddess Lakshmi holds such a left-handed conch, Hindus believe it to be auspicious and a symbol of wealth. Dawood says he earns anywhere between Rs200 and Rs400 for such conches. End users are willing to pay hundreds of times that. If exported after cleaning, the conch can cost at least $2,000 (around Rs80,000). Orauuam Mahender, manager of Sri Navratna Museum of Natural Wonders that sells sacred Vedic shells, pearls, herbs, jewels, stones, trees and seeds in Thailand, says rare conches with special Vedic significance sell for several thousand dollars in the international market. “Because they are so rare and auspicious, even non-Hindus want to own them," she says. Experts believe that only a few in a thousand conches are genuine left-handed ones, with frauds rampant. Mahender says that one conch called the “lighting whelk" is often sold as the authentic Lakshmi conch because of the resemblance. “Sometimes people are fooled," she says, adding the trick is to see enough conches to eventually learn the difference. Although he does not find a special conch every day, Dawood says the work suits him, especially compared to the labourers who scour and inhale his finds. “I go out fishing when I want, and dive in when I want. I don’t have to spend 16 hours in a factory, dipping conches into acid," he said. But despite its popularity, the conch industry faces its own challenges of over-harvesting and smuggling. While there are 112,000 types of molluscs and shells, some are endangered; the Union government lists 75 on its endangered species list. Since most of them are found in the Gulf of Mannar Biosphere Reserve on the Tamil Nadu coastline, Kalam said that the fishermen can’t touch them. Last week, a Vancouver seafood firm and its chief executive were charged with smuggling 27 tonnes of queen conch, a seafood on the international list of threatened species, from the Caribbean. When asked, the workers here say they do not think of the religious significance of the conch to Hindus or the role they (the Muslim workers) play in another religion’s practice. “We are more concerned about surviving," Guni said. In Rameshwaram, Kalam and factory owner R. Gandhi control most of the conch trade. Gandhi, with three sites in Rameshwaram, exports to the Philippines, Indonesia and the US. One of his two sons, G. Rajashekhar, a 24-year-old marine engineer, leaves for the US this month to expand the family’s Rs5 crore business in California and Louisiana. While 60% of Gandhi’s business consists of conch sales, the rest comes from lampshades, lanterns, shell curtains, shell jewellery, shell designs on wall hangings and other handicrafts. “People in other countries value handmade things a lot," Gandhi said. Despite the growth of overseas markets, the highest demand still comes from West Bengal and temples across India. Kalam takes prides in supplying the major Shiva temples in the country. “The next time you go to Somnath or Omkareshawar (both have popular Shiva temples) and hear the conch blow, think of me."